One of the first things a lot of people do at the start of a year is to take a look at the calendar and mark all the long weekends in the year. When a holiday falls on a Friday or Monday, or both, we have a long weekend. If you want to be specific about how many days you get off from work or school, you can say 3-day weekend or 4-day weekend. 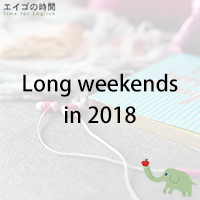 In Japan, when a public holiday falls on a Sunday, we get the following Monday off, which also constitutes a long weekend. But generally, this rule doesn’t apply to Saturday holidays. So, when a holiday falls on a Saturday, we feel somehow ripped off. Anyhow, in 2018, three holidays fall on a Saturday and we have nine long weekends, which is slightly better news especially for travelers because there were four Saturday holidays and eight long weekends in 2017. 1. When a public holiday falls on a Saturday, we get the following Monday off. 2. Three public holidays fell on a Saturday in 2017. 3. A long weekend includes Saturday and Sunday with at least one extra day added.